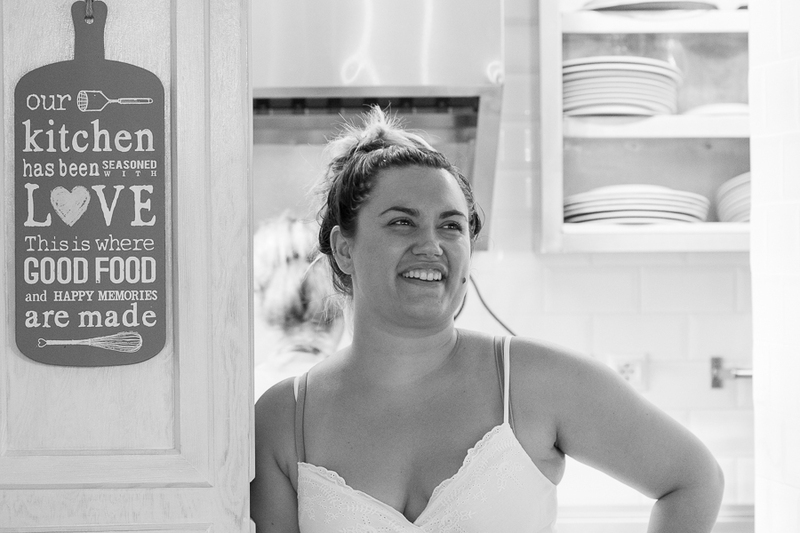 I am very excited to introduce you to my daughter Dora on today’s blog! She partly grew up on Poros, is now 24 years old and today runs Odyssey Bistro and organizes all the weddings and parties. I am so proud of her. 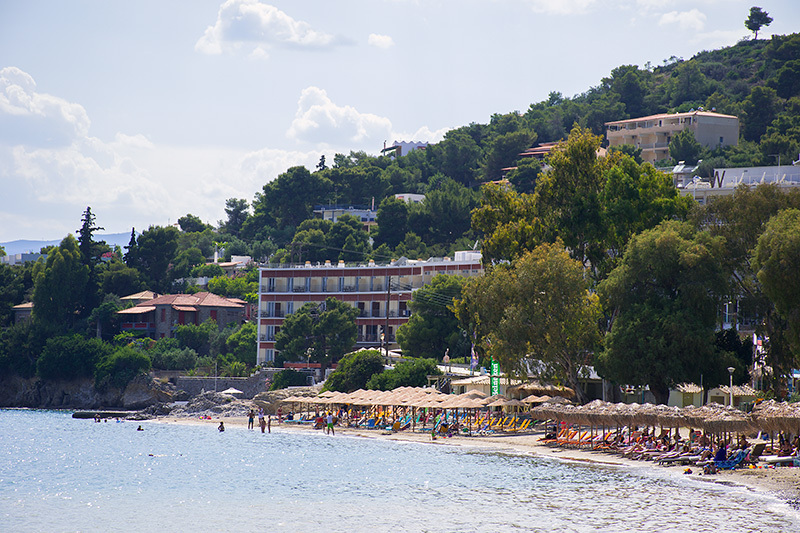 Dora will share with you her top 10 beaches on Poros! 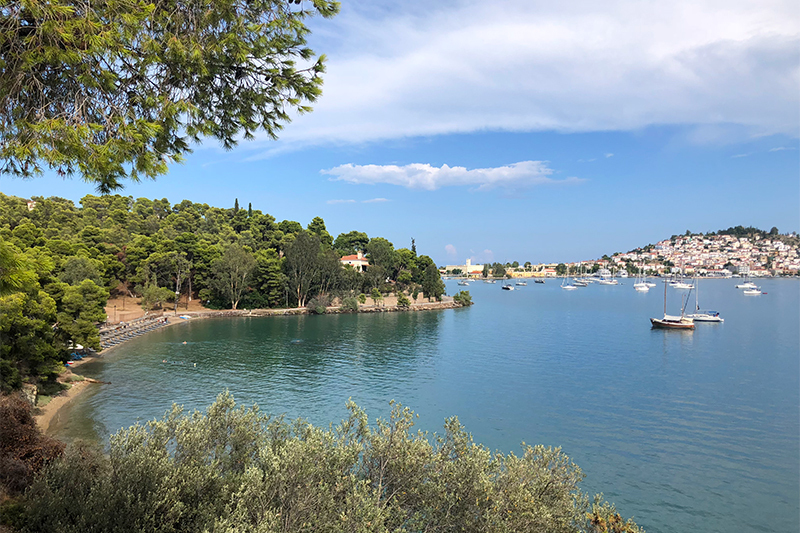 Before you read my top 10 beaches of Poros, please note that it was very hard to make this list, because Poros has so many lovely beaches and I like all of them. 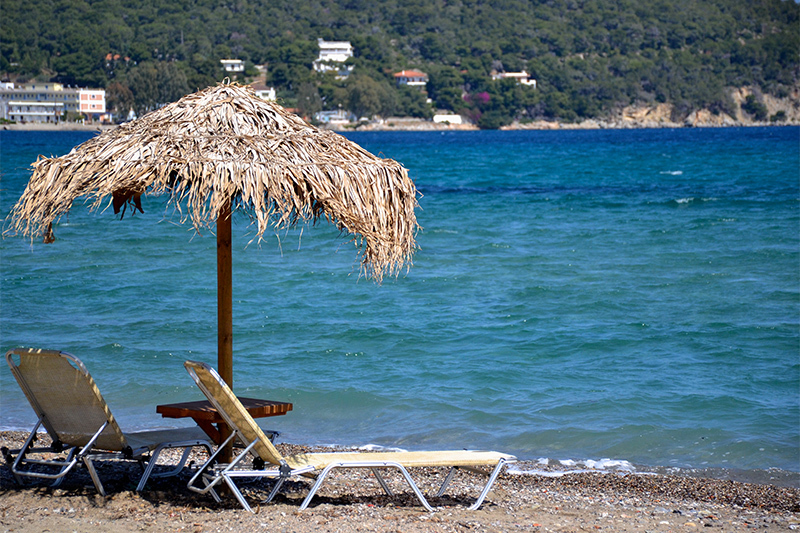 One of my favorite things about Poros is that there is a beach for every occasion and mood. This beach has sand forever! The further you go into the sea the shallower it gets. Kanali Beach has 2 amazing restaurants: Captains Beach Bar and Kanali Beach Bar & Restaurant. I recommend both! Beach bar Anasa Café has only been on this beach for a couple of years, but the owners have created and immense cool atmosphere by using Persian rugs and renting out shisha pipes. When asked nicely, the luxurious Sirene Blue Resort allows you to stay at it’s beach and pool area if you order something. Their bar is open to everybody and has the most amazing view on the coastline of the Monastery Beach. According to some this beach has the cleanest water in Poros (it definitely has the coldest). Fun fact: It is said that the monastery has a secret and hidden underwater tunnel to an uninhabited island (Bourtzi). 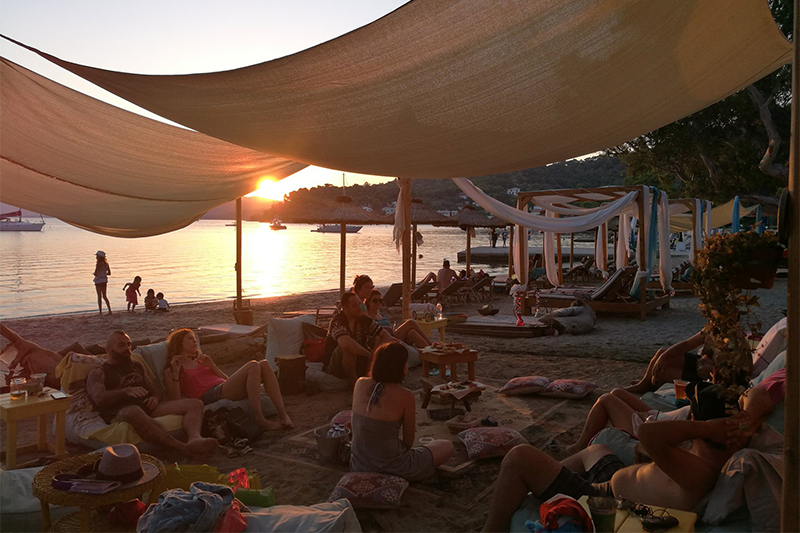 Love Bay is one of the most, if not the most popular beach on Poros island, and it’s easy to understand why. 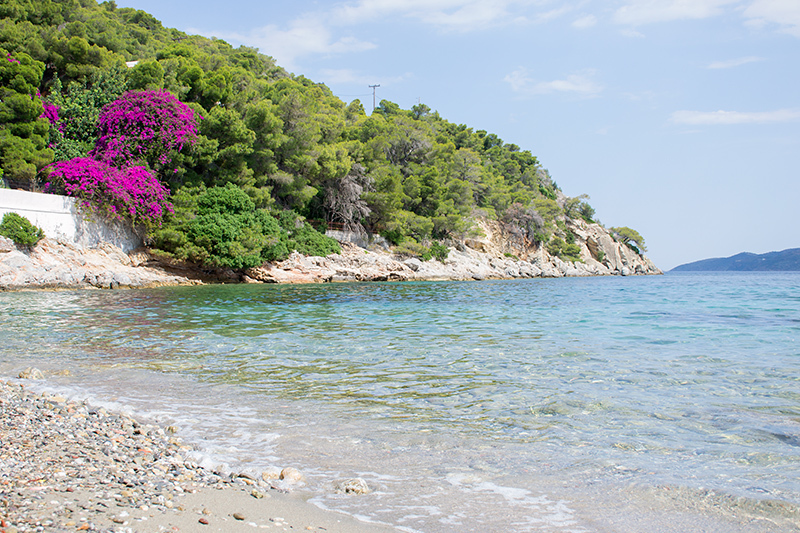 Love Bay is one of the smaller beaches and situated in a beautiful bay that is surrounded by pine trees. All together this creates a very cozy and welcoming atmosphere. A boy and girl fell in love, but their families did not like each other and forbade them to be together. So they would sneak around and secretly meet at Love Bay. Their parents found out and were furious, so they decided to elope. They took a boat from Love Bay and sailed off to get married, but sadly enough they both drowned. Love Bay is the last place remembering them and their love. They say if you fall in love at Love Bay, it will last forever. Fun fact: Every Sunday in high season they have beach parties. 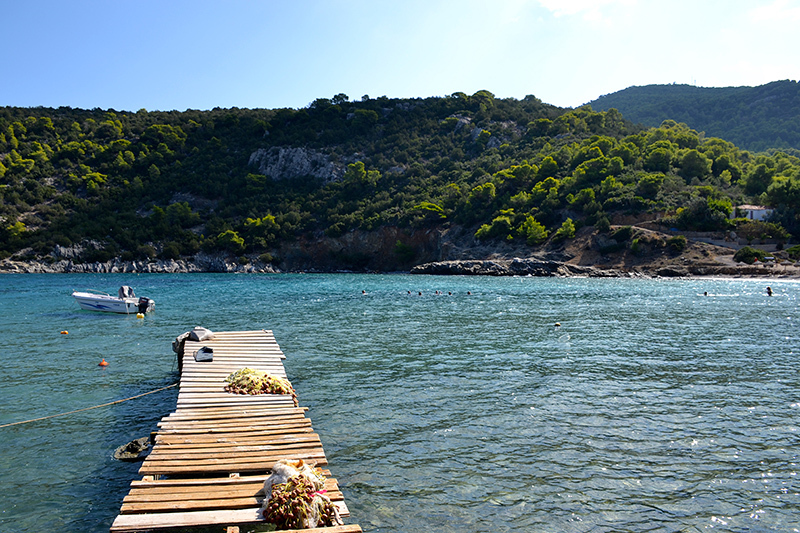 The owners are certified divers and at one point used to teach diving on Poros. Sadly due to new regulations this became very hard to do. Russian Bay holds the ruins of an old Russian naval station from 1820 and is an absolute must see in my opinion. Located directly opposite Russian Bay and within swimming / snorkeling distance is Teachers Island (Daskalio). This tiny island with a church on it is also called the island of love, as the island is heart shaped. When I was in my preteens (not too long ago), Russian Bay was used as a background for theatre plays. One of my fondest memories is going to one of these open air plays with my parents. Fun fact: Café Russian Bay is open all year round for coffees, breakfast and lunch. 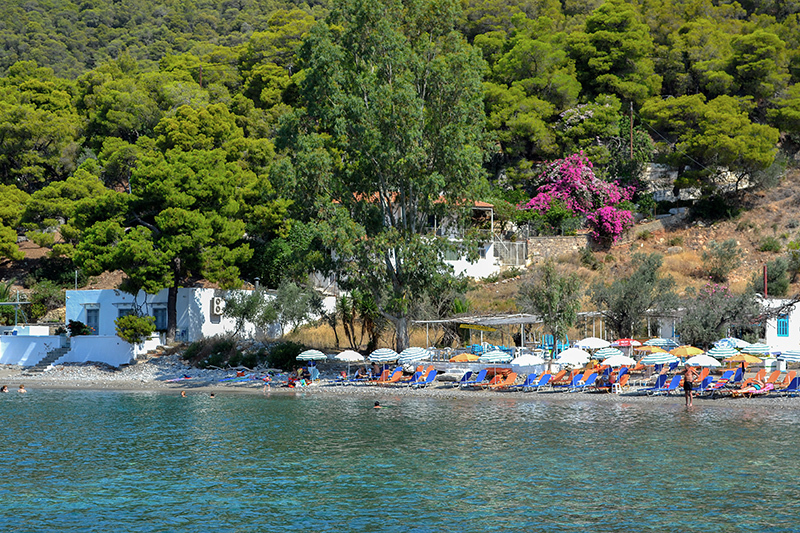 Vayonia Bay is located at the back of Poros island. I don’t know a better way to describe it than that it gives you the feeling of being on a deserted island with a beach-bar on it. It is a very beautiful and picturesque bay with a calming atmosphere. It is almost as if time stands still there. Unfortunately Vayonia Bay is closed at the moment because of excavations. 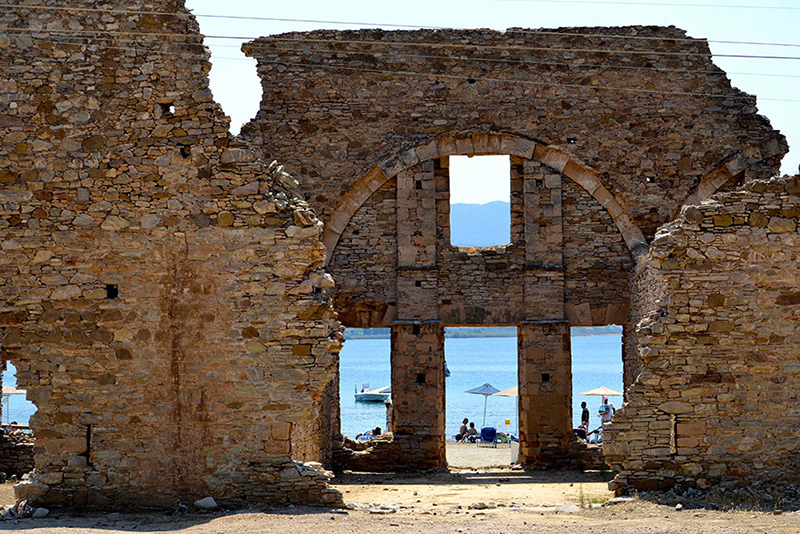 Fun fact: Hundreds of years ago Vayonia Bay used to be the main port of Poros. If you go snorkeling you can see the sunken port under the water. Not so fun fact: beware of the wasps – I was stung on my tongue a couple of years ago. 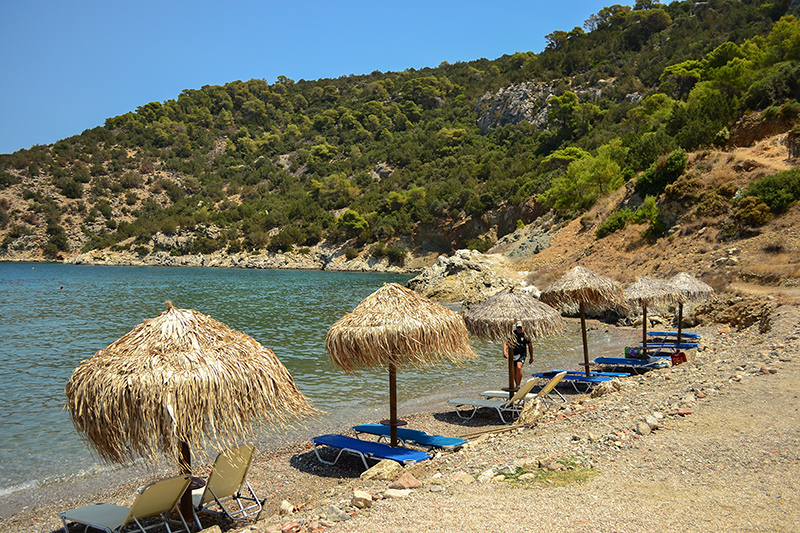 Askeli beach is only a 2 minute walk from Odyssey. Being so close to Odyssey it was the beach where I would spend most of my summers, and where my mother always took time from her busy schedule to go sailing with me. 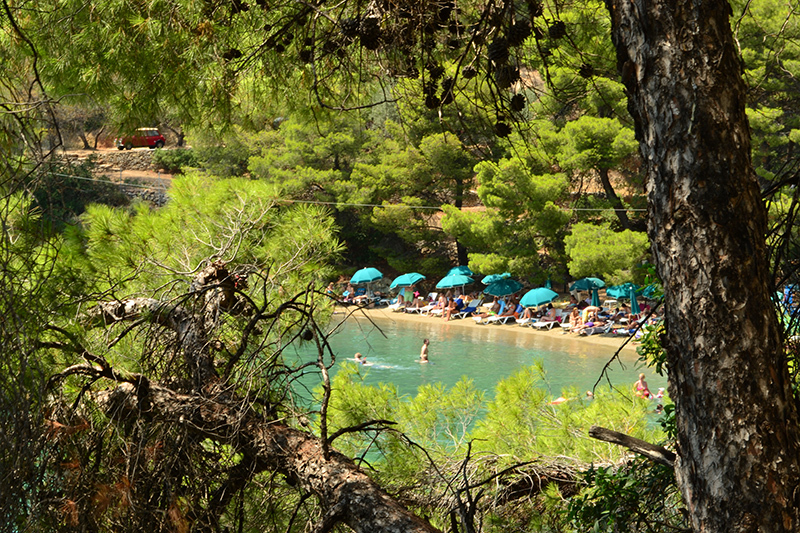 Askeli beach is one of the largest beaches of Poros and also one of the sandiest. It’s a beach for relaxation and recreation, with it’s many different sunbeds from different bars where you can enjoy lovely drinks and snacks. Askeli Beach is also very family-friendly. Fun fact: Right opposite Odyssey and on the water is a water sports center where you can learn how to water ski, go parasailing or maybe go on the tubes!! Panagitsa is maybe not an official beach, but it’s my personal favorite. 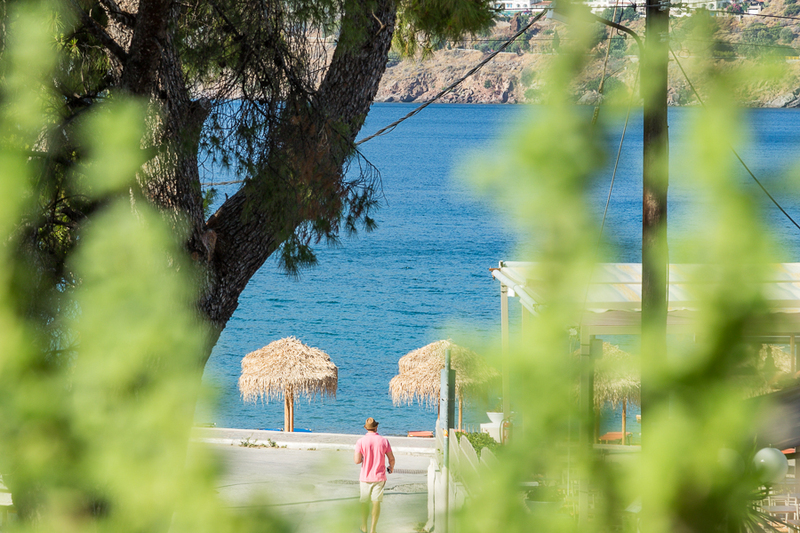 The beach is located in Askeli within walking distance of Odyssey and the Askeli beach. 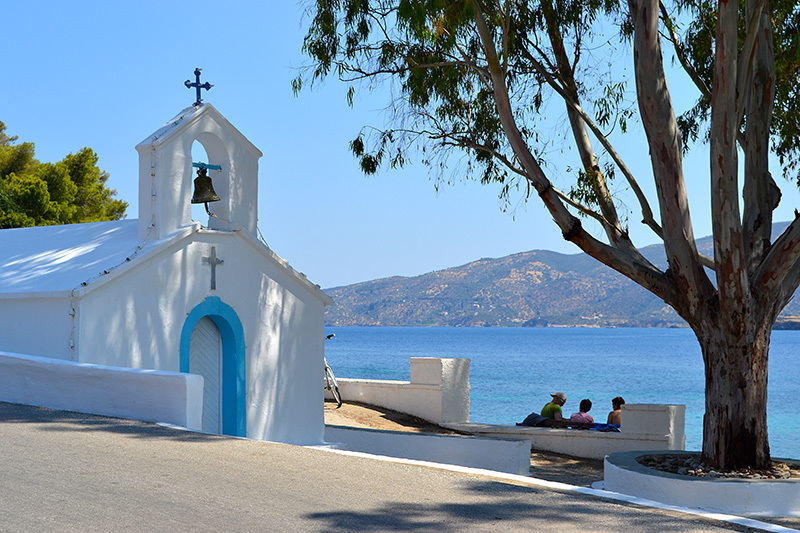 Panagitsa beach is named after the little church on its premises. It is a very rocky beach with hardly any sand on it and you definitely need a pair of those unflattering water shoes to get in, so why is it my favorite? Because it is absolutely perfect for snorkeling! With the surroundings of the rocky mountains you can find the most beautiful fish, corals and octopi. If you snorkel and swim far enough you will encounter a tiny little private pebble beach! I loved reading (and remembering) these beaches. Great job Dora! 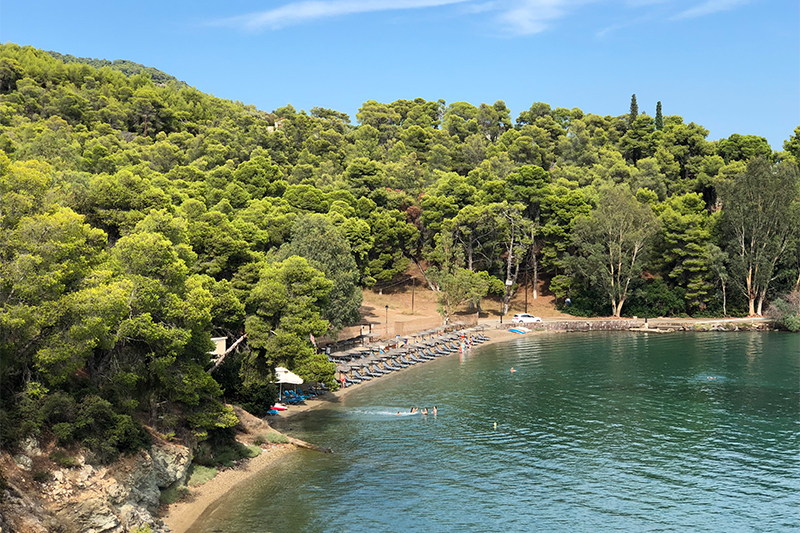 Thank you so much, it was very difficult making a list because all the beaches on Poros are so lovely and each has their own atmosphere. As I said a beach for every mood and occasion. Thank you! It was so much fun to tell my side of the story of each beach. And I am so so happy it will make you try a new beach. Have fun snorkelling ?? Very beatiful beaches! We have seen som of them!! Nice !!! 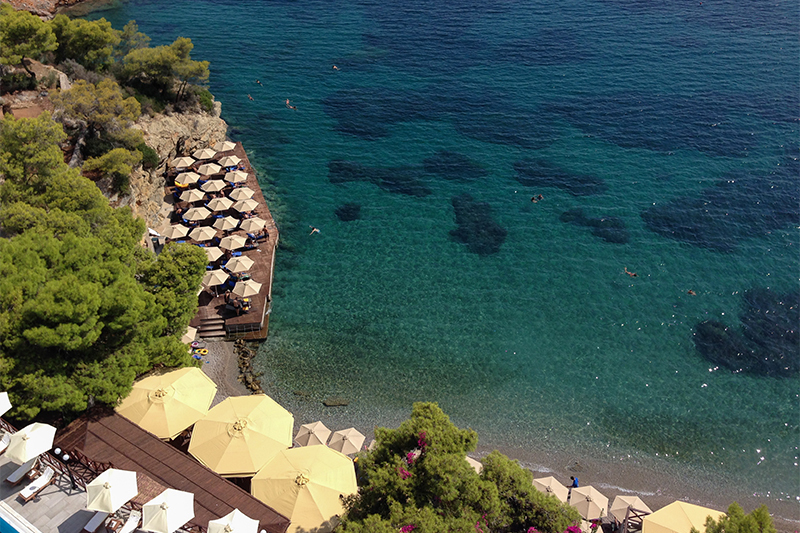 I am glad you have seen some beaches of Poros. Have fun exploring more of them! How nice that you are coming to our beautiful Poros. 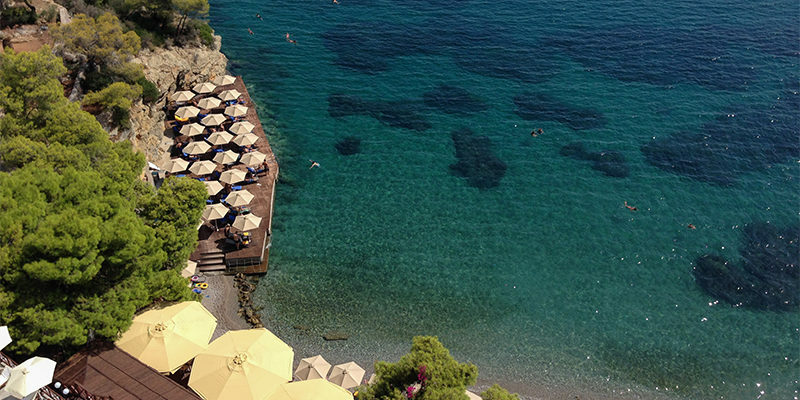 7 brothers is a beautiful hotel in Poros town. There should be a bus that you can take to the Askeli area. For the Neorio area, they are talking about organising a second bus line but it has not yet begun. You can of course take a taxi or maybe even rent a moped or bicycle. 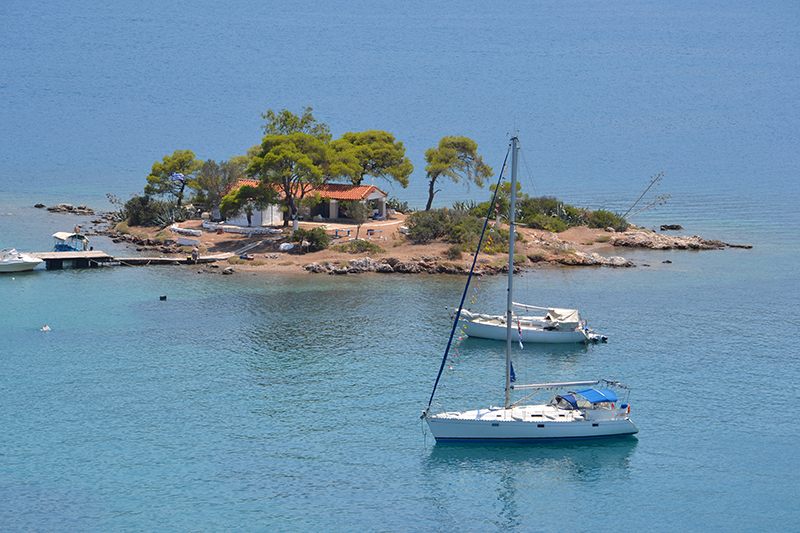 Enjoy your time on Poros!